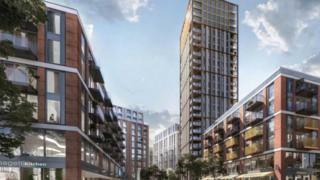 A inquiry will decide on a £250m redevelopment of a shopping complex, including 1,250 new homes, after plans were called in by the government. The tower block of apartments, a cinema, hotel and shops at 1960s-built Anglia Square in Norwich were approved by the city council in December. The proposal, which received more than 700 objections, will now be determined by the communities secretary. A council spokesman said the decision would "substantially delay progress". Developer Weston Homes said it would consult stakeholders before deciding its next course of action. "We are very disappointed by this news," said the council, adding the site was in desperate need of development. "[It will] also make it very unlikely that Norwich will be able to benefit from the £12.2m of government funds already allocated to this development." Historic England - which called for an independent inquiry - said it welcomed the government's decision. It said the "damaging scheme" would have a severe impact on Norwich, which it described as one of Europe's great historic cities. Many of the hundreds of objectors expressed concern the tower block would have a negative impact on the skyline and could set a "precedent" for other development in the city. There were also claims "gentrification" would displace the existing local community. The Dean and Chapter of Norwich Cathedral had said it welcomed the need for redevelopment but felt the scheme would "dwarf" its neighbours. Some 120 comments in support said Anglia Square and the derelict seven-storey Sovereign House needed a fresh look, with its redevelopment discussed for several years without progress. Iceland, QD and Poundland currently occupy larger stores but a multi-storey car park is disused and a cinema that hosted the premiere of the Alan Partridge film Alpha Papa closed last month. Weston Homes said it was "disappointed that the local democratic decision, made after extensive public consultation" had been "challenged".